Many of the pictorial Faroe Islands stamps of 1979 to 1981 feature the history and culture of the islands. The Faroe Islands postal service, in 1979, was only four years old, yet because of the wartime provisional overprints, the islands proudly commemorated the 60th anniversary of their postage stamps! 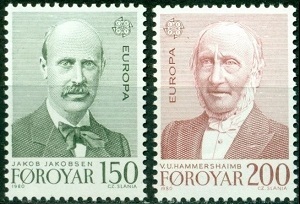 The two annual EUROPA stamps shown above (Sc. #43-44) were issued on May 7, 1979 to celebrate the 60th Anniversary of Faroe Is. Stamps. 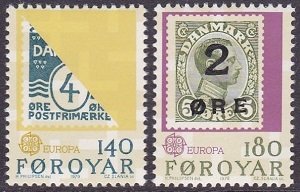 The designs feature the wartime provisional issues of 1919. The 140 øre denomination features the provisional bisect (Scott Denmark #88a). The 180 øre denomination features the two øre provisional overprint (Sc. Faroe #1). Both of these rare provisionals were used during January 1919. The autonomous government of the Faroe Islands is not part of the European Union, however the Kingdom of Denmark is part of the union, thus the issue of the Faroe Islands EUROPA stamps. The three pictorial Faroe Is. stamps shown above (Sc. #45-47) were issued on October 1, 1979 to celebrate the International Year of the Child. 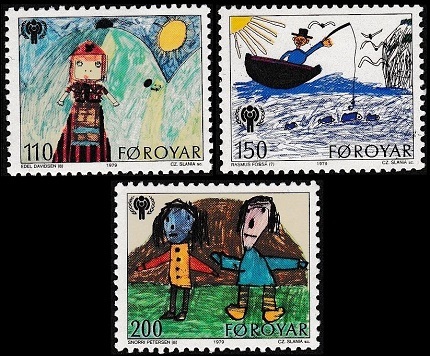 The three designs feature Faroese children's drawings. The five pictorial Faroe Is. stamps shown above (Sc. 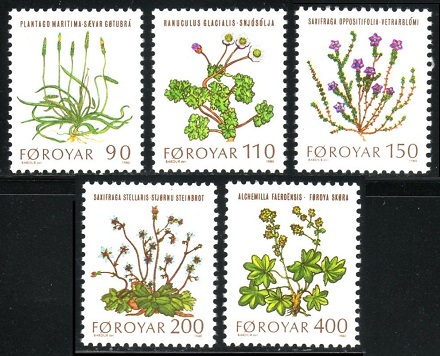 #48-52) were issued on March 17, 1980, and they feature Faroe Islands flowers. 090 Ø. - Sea Plantain. 110 Ø. - Glacier Buttercup. 150 Ø. - Purple Saxifrage. 200 Ø. - Starry Saxifrage. 400 Ø. - Lady's Mantle. The two annual EUROPA stamps shown above (Sc. #53-54) were issued on October 6, 1980. 150 Ø. - Jakob Jakobsen (1864-1919), Faroese linguist and literary scholar. 200 Ø. - Vensel Ulrich Hammershaimb (1819-1909), Faroese theologian, linguist and folklore scholar. The four art-themed Faroe Is. stamps shown above (Sc. #55-58) were issued on October 6, 1980, and they feature Pew Gables from the 12th Century St. Olav's Church in Kirkjubøur, Streymoy Island. 110 Ø. - Coat of Arms / Virgin and Child. 140 Ø. - Norwegian Coat of Arms / John the Baptist. 150 Ø. - Christ's Head / Saint Peter. 200 Ø. - Hand in Halo / Saint Paul. The four art-themed Faroe Islands stamps shown above (Sc. #59-62) were issued on March 2, 1981. 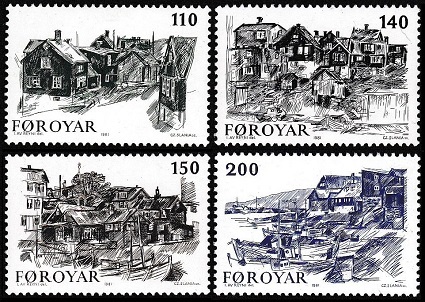 The four designs feature Sketches of Old Torshavn by Ingálvur av Reyni (1920-2005). The two annual EUROPA stamps shown above (Sc. #63-64) were issued on June 1, 1981. The two designs feature the Ring Dance and the Garter Dance. 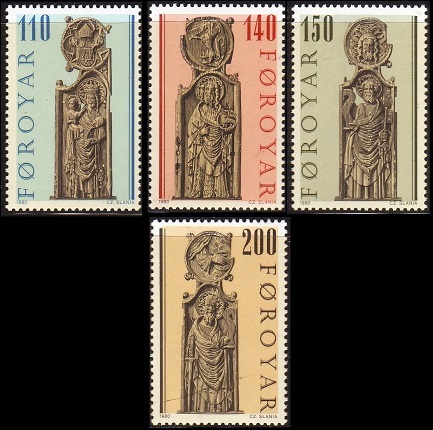 The five pictorial Faroe Islands stamps shown above (Sc. 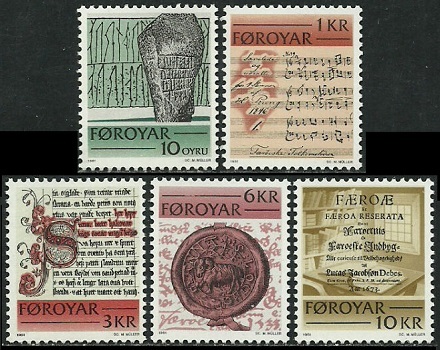 #65-69) were issued on October 19, 1981 to celebrate Faroese historical writings. 10 Ø. - Rune Stones c. 800-1000 A.D.
01 K. - Folk Song c. 1846. 03 K. - Sheep Letter, a royal decree of June 28, 1298 by Duke Haakon of Norway, the oldest surviving document of the Faroe Islands. 06 K. - Wax Seal of 1533. 10 K. - Færoæ et Færoa Reserata c. 1673, by the Danish writer, Lucas Jacobson Debes (1623-1675) in the Faroe Islands Library. The 25 Kr. 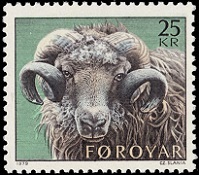 pictorial definitive Faroe Islands stamp shown above (Sc. #42) was issued on March 19, 1979. The design features a Faroe Islands Ram. The name of the islands, "Føroyar", is derived from the Old Norse word, "faer", meaning "Sheep". Thus the original meaning of "Føroyar", in Danish / Faroese, was actually "Sheep Islands".